Hello and welcome to exampundit. 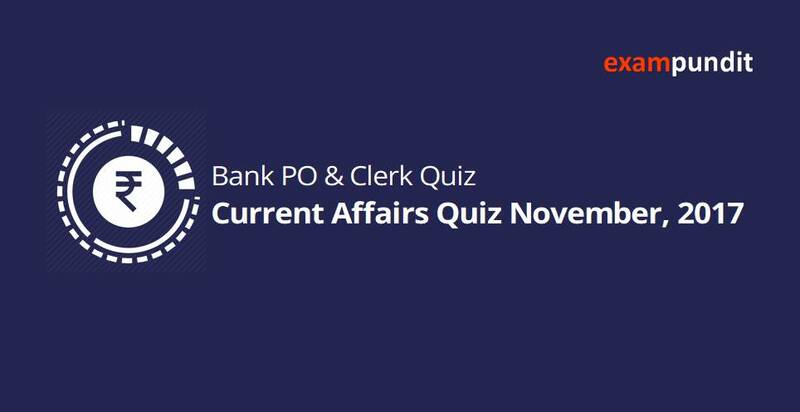 Here are important Current Affairs questions from November 5 to November 8, 2017.
international remittance service on its Money2India application? Bank waive off transaction charges? announce under the Coastal Berth Scheme of the Sagarmala Programme? promote which of the following hobbies? to collaborate on multi-radio telescope project? and fully-integrated Joint Training Node (JTN) in which of the following state? Nobel Prize Series – India event during 1-28 February 2018? Medal at the Asian Boxing Championship 2017 in ______. City Bus Services Award for attracting 87% of private vehicles users? qualify for the 2018 Women’s Hockey World Cup and win the Asia Cup 2017?